This maybe my last post because I might be run out of Louisiana for doing this. Just kidding. I don't know, I'll let y'all know. 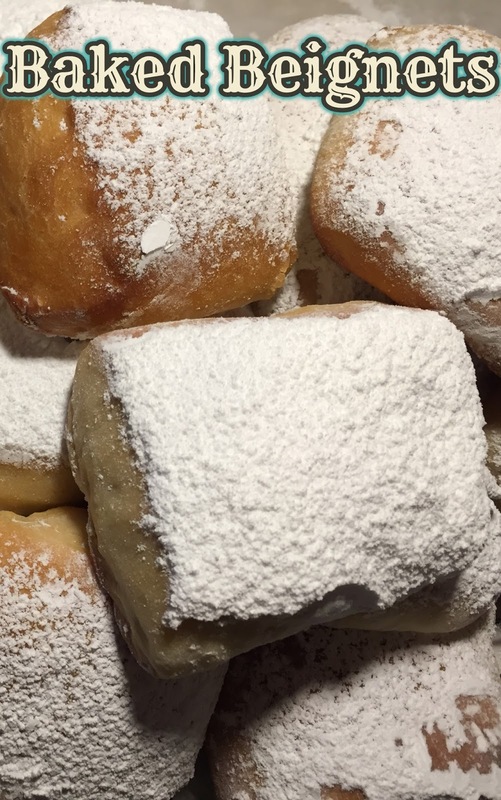 Beignets pronounced like ben-yay or ben-yays are traditional fried and smothered in powder sugar. I mean really covered especially the ones at Café du Monde in New Orleans, is has been opened 1862 near Jackson Square and French Quarter on Decatur Street. 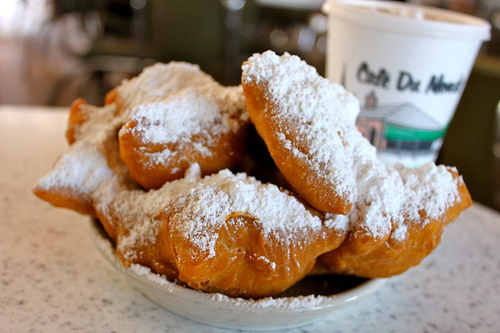 When you order them at Café du Monde they always arrive fresh and hot. Beignets were brought to Louisiana by Acadians, they were fried fritters and sometimes filled with fruits but today they are fried piece of dough and covered in powdered sugar. Unlike traditional doughnuts they do not have a hole in the middle, square instead round, coated in only powdered sugar and not as sweet. Have ingredients like milk, eggs, water and butter room temperature so they will mix well. 1. 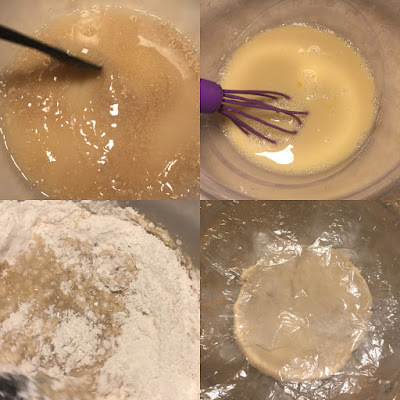 In a large bowl, combine water, yeast and sugar. Let the yeast bloom for 5 to 10 minutes. 2. In a medium bowl, whisk together warm milk, eggs, vanilla and salt. 3. Once the yeast has bloomed add egg mixture to the yeast. Add cooled butter to the mixture. 4. Slowly add flour to the liquid until well combined. Using your hands and spoon form into a ball. The dough will be sticky, that's okay. 5. Grease another bowl with a little canola oil and transfer dough. 6.Cover and let proof for at least 2 hours or in the fridge overnight (that's what I did). 7. Place parchment paper onto cookie sheets. 8. Divide in half. Dust a little flour on the rolling pin and dough. Roll dough out to a 1/2 inch thick then with a pizza cutter, cut dough out to 2 1/2 inch by 2 1/2 inch pieces. 9. Place on to cookie sheets covered in parchment paper, cover and let sit for 30 to 45 minutes. 10. Preheat oven to 350o degrees. Brush a little milk on top of the beignet dough. 111. Bake for 14 to 16 minutes, or until golden brown. Rotating the pans halfway through the baking. 12. Take beignets off of pans and place on a wired rack, with the mess strainer dust powder sugar of the beignets. Let them cool for 5 minutes before consuming. Store beignets in tight container. Stays fresh for up to a week. You do not have to dust powder sugar on all of them. Those look delicious! I love the option of baking them rather than frying them too. Thanks for sharing this different technique! I absolutely LOVE beignets! These look amaing, definitely going to make my own with this recipe! These look so delicious! I've never tried a fried one so when I see how delicious these are, I won't even compare them to anything else :) They kind of seem like what we call zeppoles here in New Jersey. Basically a funnel cake but a different shape? Yeah, I guess you can say that are like funnel cakes but in a different shape. These look so YUMMY! I will have to try this recipe! Wow, these look incredible! I feel like I have heard of a Beignet before but I don't believe I have ever had the pleasure of trying one. Will definitely try this out one day! I have never had a beignet before, But this looks so good. It also seemed easy enough to make. I saved this recipe. It's damn good.